Anticipating the evolution towards self-sufficiency, PowerTech Systems has decided to turn to Lithium-Ion storage batteries associated to independent systems of energy production. All over the world, small districts will sparse population and often rugged geography are beyond the viable reach of the regional grid system. And many countries suffer from power outage too. Stand-alone renewables are the obvious solution. But electrifying remote areas means to provide a long masting solution with a reliable storage item and very low maintenance. PowerRack is a 100% modular, 19 inches Lithium-Ion battery system. 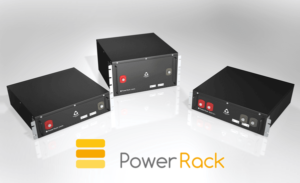 BMSMatrix® embedded system : this technology embeds PowerRack intelligence providing an incredible modularity and scalability to the system: PowerRack can manage ESS as small as 2.5kWh-48V, but can easily scale up to some large ESS of more than 1MWh-1000V. Solar panels do not work at night or in cloudy conditions, wind mills depend on wind conditions, power generators depend on oil supply. Real time energy generation has to be stored to optimize domestic use with no rupture of energy and permanent control on the storage reserve level. Storage capability must be durably reliable, eco friendly and ready to handle long short cut of power supply. Why Lithium-Ion batteries for Self-consumption ? Lithium-ion batteries have an energy density exceeding 150 Wh/kg. The energy density of a lead acid battery is about 20 to 30 Wh/kg. Lithium-Ion batteries support up to 5000 thousand charge cycles and discharge unlike conventional lead batteries (about 500 cycles).